2013 started with a bang for SUWO. The early months saw the band adapt a new logo and visual identity. Benjamin Tang’s logo is a vivid representation of Sydney University Wind Orchestra as a band. The stylised circles are highly symbolic while also achieving a vibrant, diverse, youthful and professional look. The concept of concentric circles demonstrates unity between instruments. Whether it be keys on winds, valves on brass or drums and cymbals in percussion. It equally represents all instruments, and this equality between members is a core value of SUWO. We had a chance to show off our new look with stylish new T-Shirts and banners at O-Week where we signed up a record breaking 64 members. More records were set with an incredible sustained attendance record at all rehearsals so far in 2013. Week one saw band members finish rehearsal early to enjoy a sausage sizzle meet & Greet. Continuing on from our successful Amazing Race in 2012 we decided to come back bigger and better in 2013. This year we invited members of two of USYD’s other musical powerhouses- The Sydney Unversity Symphony Orchestra and Sydney University Musical Society to participate in The Amazing Musicians’ Race. With the theme Musicians go to the zoo, race participants we put through a series of roadblocks and detours with animal themed tasks. It was a truly successful event and one which we plan on repeating before the year’s through. 2012 was another highly successful year for the band. More milestones were set with the first ever Orientation week “SUWO Amazing Race” Scavenger Hunt (won by the Clarinets and Oboes), a record average attendance of 50 across the year and a hugely successful Semester 1 concert, Ride!. SUWO has also met its goal of purchasing important percussion instruments, including a gong, crash cymbals and orchestral bells. In August SUWO received 2nd Place honours at the 2012 NSW State Band Championships in the Open B Grade Concert division. We also raised over $500 at our annual Showcase pre-states fundraising concert. The band finished off the year with three major events. SUWO’s end of year concert, Folk and Legends at the Italian Forum culminated in a stunning performance of music from the Lord of the Rings film trilogy, featuring guest soloists on soprano voice and violin. It also featured the surprise proposal from SUWO’s Trumpet Section Leader, Stephen, to Kat our principal Alto Clarinet player. It should be noted that the proposal was 100% successful. In December, SUWO went Dancing- taking its music to primary school children in Campbelltown and inner Sydney. TheDancing With Suwo school concert series was a huge success, providing fun and interactive concerts to children who would not usually have the opportunity. The very next week SUWO travelled south to Canberra. The band thoroughly enjoyed the lively concert programme at Majura Public School and Black Mountain School every bit as much as the children and teachers. It was an especially rewarding experience performing for special needs students at the Black Mountain School. Band members also had a wonderful time visiting Canberra attractions such as Questacon, The National Portrait Gallery and Canberra Zoo. All members of the Sydney University Wind Orchestra are looking forward to 2013 and all it entails. On May 24th we have a spectacular concert featuring Ghost Train, by Eric Whitacre, at the Italian Forum Cultural Centre and November 1st will see the band celebrating its 10th anniversary with yet another spectacular concert. We look forward to seeing everyone there! 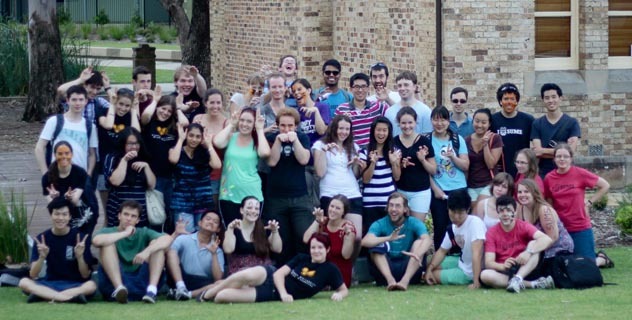 2011 saw SUWO undergo a number of historic changes, starting with a new record of 48 members signed up at O-Week and 52 attending the first rehearsal. SUWO also finally grew out of its “Small Club” (less than 100 members) category, preventing SUWO from applying for the title of “Best Small Club 2011” which it might otherwise have won for the 6th year in a row.At the end of 2010, SUWO said a reluctant farewell to beloved conductor Narinder Grewal (having just become Narinder Vaccarella), who had been present at the band’s creation in 2003 and conducted the band week in and week out from 2004-2010. Adrian Tan took over in Week 1 and introduced a new approach and radically new music to the band, exemplified in the feature pieces for Semester 1, Godzilla Eats Las Vegas by Eric Whittacre and Outback by Thomas Doss. Godzilla required members of the band to stomp, scream, bark like a dog, wolf-whistle on a trombone, and run a slideshow for the audience. ‘Outback’ required weeks of intense workshopping by SUWO’s percussion players and also featured a didgeridoo player and a bullroarer. The ‘Godzilla’ concert was a historic milestone for the band, taking place in Sydney University’s Great Hall and receiving record audience numbers and an intake of over $2,000. SUWO’s Camp, Trivia Night and Kids’ Concerts programme ran again in 2011. This year, SUWO travelled out to the edges of the Western suburbs to give a day of school concerts in St Marys as well as two days of school concerts in inner-city Sydney. SUWO then kicked into high gear at the annual winter Camp with preparations for the NSW State Championships in September, culminating in the band taking first place in “B Grade Concert” out of 4 bands. This historic achievement is testimony to the enormous talent and hard work put in by the band and the 2011 Conductor Adrian Tan. After the States, the band again had to farewell its conductor as Adrian Tan completed his Masters at the Conservatorium of Music. SUWO ran conductor auditions in the second half of Semester 2, resulting in the election of Stephen Capaldo as 2012 Conductor. SUWO finished off the year with a bang with a return to Nowra in Tour 2012, giving concerts at local primary schools with the Shoalhaven City Concert Band. 2010 was again an eventful year for SUWO. All the previously established events were maintained, including the regular social events and semester performances, July Band camp, Concerts for Kids! series, NSW State Band Championships and end of year tour. As always though, a few next exciting developments occurred. 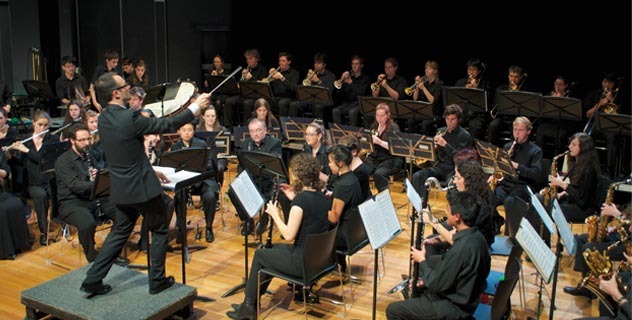 One exciting event was SUWO’s first collaboration with the UNSW Wind Band, a joint performance in semester 1. Each band performed a set of works, combining for a magnificent finale of almost 100 performers. It is hoped by both ensembles that this event will occur biennially in the future. In 2010 SUWO was also able to seek the support of outside business for the first time, receiving gift donations & discounts at local music store Sax & Woodwind. Another exciting endeavour was the Music Trivia Night, which doubled as being the social attendance of possibly the highest attendance yet, while raising almost $1000 for the band. The end of year concert Springtime for SUWO was a great way to highlight the hard work and increase in musical standard of the band throughout the year. Band members then travelled to the Lake Macquarie region where they collaborated with the Western Lake Macquarie Concert Band for both a schools workshop and rehearsal. Once again the year was topped off with the recognition of being titled Sydney University’s best small club (fewer than 100 members), a position the band has now held for five consecutive years! 2009 continued the traditions established in 2007 and 2008 and added some new events to the SUWO calendar. First semester’s concert, Sounds of SUWO, was soon followed by the superhero-themed school concerts entitled Bandman and Robin. With six schools, seven concerts and one workshop, the 2009 Concerts for Kids! series was SUWO’s biggest yet. Camp was held for three nights in the Blue Mountains, and focussed on preparation for SUWO’s first entry in the NSW State Band Championships. SUWO performed three challenging pieces (El Camino Real, Suite of Old American Dances and Irish Tune from Country Derry) in the Championships’ B Grade, placing second. SUWO gave its second semester concert, titled Spring Soiree: Across the Atlantic, at the Conservatorium of Music. The year ended with SUWO’s first fully-fledged regional tour as the group travelled to the South Coast for four nights. The popular Concerts for Kids! series was taken out of Sydney for the first time, with Music in the South performed at three primary schools in and around Nowra. SUWO also collaborated with the Shoalhaven City Concert Band to give an evening concert entitled City Meets the Sea, at which the two bands performed both separately and together. A busy and successful year was capped by SUWO winning its fourth consecutive Best Small Club Award, a recognition of which all members are rightfully proud. In 2008, SUWO performed a concert called SuWow! in semester 1. The second Concerts for Kids! series, that year magic-themed and entitled Bandakadabra, were held at the start of the winter university holidays and enjoyed by five Sydney schools. These were followed by SUWO’s second annual band camp, held over three nights at Port Stephens. In Semester 2, SUWO performed with the Sydney Eclectic Composers’ Society at the Conservatorium of Music. In addition to our regular repertoire, SUWO also performed three original concert band pieces written by SECS members. 2008 also saw an increase in SUWO social events, including regular trips to Newtown for dinner after rehearsals. SUWO was thrilled to receive the Best Small Club Award for the third time at the end of the years. 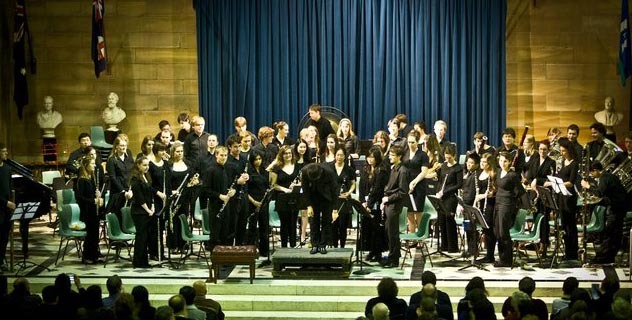 In 2007, SUWO established two events that have become staples of our calendar – our band camp and our Concerts for Kids! school concert series. During the winter university holidays, SUWO travelled to Port Hacking for two nights for our first band camp. This was followed by Swashbuckling University Wind Orchestra, the first Concerts for Kids! series. SUWO dressed up as pirates and performed for three primary schools in Sydney. In August, SUWO also competed in the McDonald’s Performing Arts Challenge. Again, a formal concert was held on campus each semester – No Strings Attached with JazzSoc’s Big Band in semester 1, and Extravaganza in semester 2. A year of hard work and new events was rewarded when SUWO again won the Best Small Club prize at the Union’s Clubs and Societies Awards night. 2006 was a year of consolidation for SUWO. Two concerts were given that year, Tunes for All Moods in first semester and Music from the Movies and Beyond in second semester. SUWO also competed in both the Yamaha Festival and the McDonald’s Performing Arts Challenge. The biggest change of 2006 was that the group agreed to employ Narinder as our professional conductor. This decision meant that the society also introduced a band fee which was paid by active members of SUWO each semester. In conjunction with funding from the Union, band fees went towards conductor’s pay, purchase of sheet music and other equipment, competition entry fees and social events, and allowed the society to expand and consolidate. The year ended on an unexpected high when SUWO won the University of Sydney Union’s Best Small Club Award. Nevertheless, SUWO entered 2005 in a strong position for a new club, and recruited many new members after having its own stall at O-Week for the first time. In first semester, SUWO and SUSO gave a joint concert called Double Bill: A Celebration of Orchestral Works in the University of Sydney’s Great Hall. SUWO also competed in the Yamaha Festival in the Open B Grade, and were thrilled to win a Gold Award and be invited to play at the Festival’s Command Performance. In second semester, rehearsals moved from Tuesdays to Thursday and were also lengthened to three hours in an effort to further improve the musical quality of the group. At the end of the year, a small contingent of SUWO members travelled to Dubbo, where they performed at several schools and also gave a public concert. 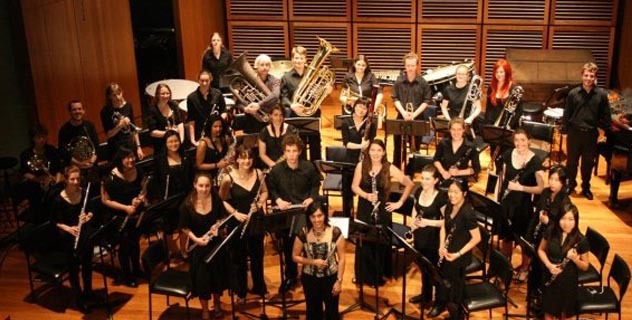 The Sydney University Wind Orchestra was founded in 2003, and its inaugural rehearsal was held during second semester. SUWO slowly grew over the next year, especially after O-Week in 2004 when the Sydney University Symphony Orchestra allowed SUWO to share their stall in order to recruit new members. Narinder Grewal became the conductor of SUWO at the start of 2004, a position she held until 2010. During the first semester of 2004, SUWO became a registered society of the University of Sydney Union’s Clubs and Societies programme, and held its first AGM in May. SUWO also gave its first official performance that semester, as part of the Music Department’s Lunchtime Concert series. Unfortunately logistical issues resulted in the cancellation of the planned second semester concert. Many thanks to Coco Page, Veronica Rynn and Lachlan Sunderland for compiling the history of the band.